Some pre-Basel 2009 news from our friends in Bienne, Switzerland. Every 5 years, Omega introduces a tribute Limited Edition Speedmaster Professional for the original ‘Moonwatch’ that landed on the Moon 21 July 1969, on the wrist of Buzz Aldrin. This coming July 21st, it will be 40 years ago that Aldrin had his caliber 321 Speedmaster Professional strapped on his space suit and Armstrong left his watch in the Lunar Module because of a defect electronic timing system. Check my earlier post on the exact Speedmaster models used during this mission. You can find it here: https://www.fratellowatches.com/archives/2008/07/21/omega-speedmaster-it-is-39-years-ago/. As you might know, I am a big fan of these Speedmaster Professional watches. They embody everything a perfect chronograph should be. Timeless casing, excellent readability, easy to operate chronograph buttons (no screw-down pushers), fit for stainless steel bracelets and leather straps, proven hand wound chronograph movement by Lemania (Omega caliber 1861) and a great history! Enough ranting about my favorite chronograph, let’s see what this new 40th Anniversary Model is about. The original Apollo 11 patch has been placed on the subdial of 9 o’clock. This patch was designed by astronaut Michael Collins. He was the third Apollo 11 astronaut, and remained aboard the Apollo 11 capsule as Command Module Pilot while his colleagues Armstrong and Aldrin were jumping around on the surface of the moon. 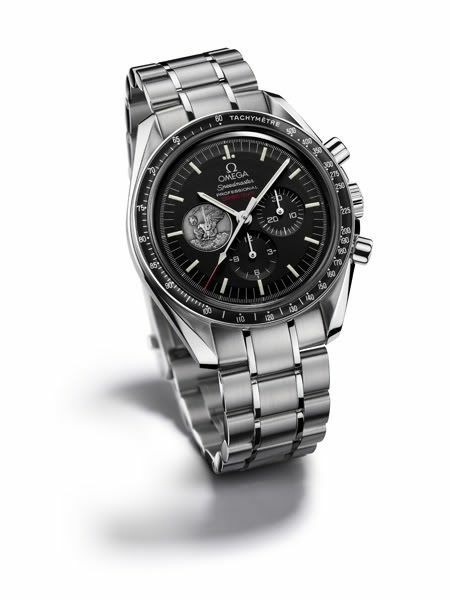 This Omega Speedmaster Pro 40th Anniversary Model will be presented in a black watch box and includes a 42mm (same size as the watch) silver medal featuring an engraving of the Apollo 11 mission patch on one side with the words ?¢?Ç¨?ìAPOLLO 11, 40th ANNIVERARY?¢?Ç¨¬ù. On the reverse side, the medal is engraved, ?¢?Ç¨?ìTHE EAGLE HAS LANDED?¢?Ç¨¬ù; ?¢?Ç¨?ìLAUNCHED JULY 16 1969?¢?Ç¨¬ù; ?¢?Ç¨?ìLANDED JULY 20, 1969?¢?Ç¨¬ù; and ?¢?Ç¨?ìRETURNED, JULY 24, 1969?¢?Ç¨¬ù. Also in the black presentation box is an envelope containing a black polishing cloth with information commemorating the historic space flight. This watch could cause another watch to leave from my preciously built collection of watches I am afraid. Currently, I am wearing my 1969 Speedmaster Professional a lot, also to keep my 1967 Speedmaster Professional with caliber 321 movement ‘fresh’ and in prestine condition. This all-new 40 year younger watch will be a great addition to these two vintage beauties. I am very excited about this watch, so excited even, that the red chronograph hand tip and red printing on the dial does not bother me at all. 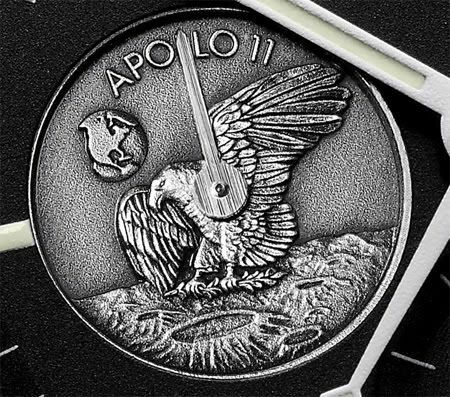 There will be 7969 pieces made of this 40th Anniversary Model, which although is not THAT limited, they might get sold out relatively quickly because the Speedmaster community is still growing every day. Try to get a hold of the older anniversary models..! Leave your thoughts about this watch in the comments or click Perpetuelle.com for their Omega Forum to write about your thoughts on this Speedy.